The leaves are turning. The temps are cooling down. You’re in top shape from a summer of action. It’s time to enjoy the most brilliant season in the Colorado mountains. Summer is slipping away, but don’t despair. Hillsides alight in fiery red, burnt orange, and glimmering gold up the “wow-factor” of already incredible Colorado adventures. Welcome the cooling temps and the shorter days by exploring our favorite spots so you can get the most out of this pumpkin-apple-flannel-filled season. No spot shows off fall colors and delivers world-class singletrack better than Crested Butte’s Kebler Pass. Two outstanding trails, Kebler Wagon Trail #606 and Dyke Trail #838, roll through one of the state’s largest aspen stands. It may be just a little over five miles long, but the Dyke Trail delivers all the action a mountain biker can handle. Or you can rack up some gravel-grinder miles and explore the 30-mile Kebler Pass Road (CO 12), a sweet mellow gravel route that tops out at 10,000 feet along its picturesque journey from CB to Highway 133 near Paonia Dam (it also makes for a stunning, chill scenic drive). Either way, you will find yourself in the midst of those aspens. Closer to Denver, the 30-plus miles of challenging riding on the Colorado Trail from Kenosha Pass to Breckenridge has it all: lung-busting climbs, giggle-inducing descents, techy rock sections and fast flowy miles. Add in panoramic views, a high point of 12,000 feet on Georgia Pass, and stands of radiant aspens, and it makes for a classic, must-do autumn ride. Summer weekends on a fourteener can feel more like a trip to the mall than the wild. But come fall, you can find more solitude, peace, and quiet on even the most popular peaks. Before early season snows come, tackle the East Slopes route on Snowmass, a 23-mile journey that gains 5,700 feet and rambles through miles of stellar, brilliantly colored aspens. Sleep serenely under the stars at Snowmass Lake before making a push for the top, which includes a solid section of fun Class 3 scrambling to reach the 14,092-foot summit. 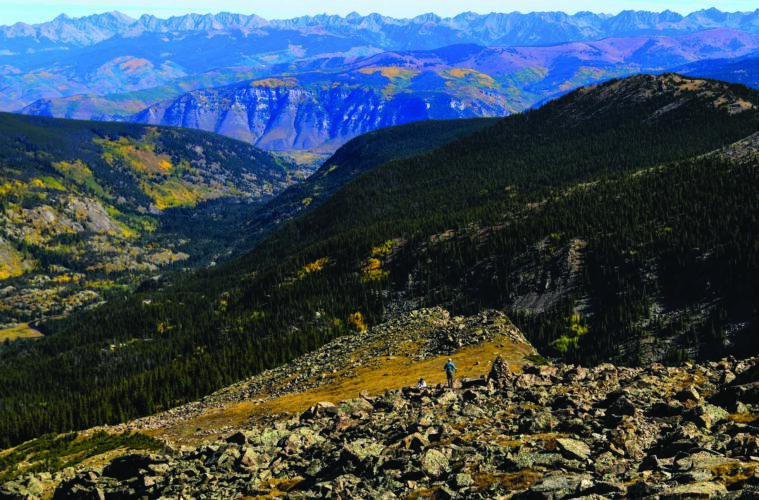 Another autumn favorite is Mount Holy Cross, the Sawatch Range’s northernmost fourteener. The 11-mile roundtrip via the North Ridge route to the 14,005-foot summit climbs through tranquil forest and offers stunning views of massive walls of flawless granite, the Gore Range and hillsides enveloped in seas of amber, crimson and orange. No fall is complete without a foray into some of the season’s most beloved customs. Actively partake in the harvest with a stop at one of the state’s countless apple-picking spots. At the 100-year old Ya Ya Farm and Orchard (yayafarmandorchard.com) in Longmont you can pick a bag of apples, press your own cider, feed farm animals, and enjoy a hay ride. At Hotchkiss’s Delicious Orchards (bigbs.com), which is also home to Big B’s cider-makers, you can stock up on apples in the shadow of Mount Lamborn, sip a cold hard cider in the taproom, and bring home other fresh veggies and fruits from the garden. There’s not shortage of festivals celebrating autumn in Colorado. Chief among them Mountain Harvest Festival in Paonia (mountainharvestfestival.org), September 27-30. The annual celebration of local music, art, farms, food and spirits is organized by the nonprofit organization Mountain Harvest Creative and highlights the music of the North Fork Valley, local arts and crafts and fun activities like the Great Chili Cookoff, Grape Stomp, Farm Tours and Saturday Sundown Swing. At Applefest in Cedaredge (cedaredgchamber.com), October 6-7, you can pick your favorite fruit and enjoy the music. Denver’s Oktoberfest (thedenveroktoberfest.com) puts a Colorado turn on the classic Bavarian beer weekend. And if you appreciate drawl and tall tales, turn your reins to the Durango Cowboy Poetry Gathering (durangocowboypoetrygathering.org), October 4-7. The four-day celebration of cowboy culture that includes performances by dozens of cowboy poets, storytellers and musicians, western art displays and a boot-stomping parade.